Cooking 4 all Seasons: Phulko Luchi ar Aloor Dom & Misti dohi ~ Bengali Cuisine! Ok, I have been scouring web sites like mad to get the perfect bangali recipes that I will be able to make and at the same time, my folks will eat. Athamma is game for anything, but hubby dear on the other hand, will not touch anything that's sweet. So having all these in mind, I asked the google God, show me bengali recipes!. Well google being google, brought me many sites, of course, most of the top listed ones, I already have bookmarked because of RCI. But still it was interested to check them out again. After going through few, I decided I will opt for the common vegetable, as it might be easy to get family eat them. I squared on Alur Dom, this sounded very much like my own Dum Aloo, but with certain variations. Clicking few random links, I found myself, where you know? At our host's place, my what a wonderful place she has. I got hooked reading through her posts. Finally out of sheer necessity logged out myself. Thus end the day one of my search. Day two, saw me pretty much the same and I finally had about 5 Bengali recipes on hand that I wanted to try. You know they say that Fried bajjis is very famous as part of their feast, sadly couldn't find one recipe that has details about it. After much search, I was able to land myself with something. Made a declaration that its going to be Bengali feast for dinner, not exactly in terms of number dishes, but in terms of satisfaction we had it was a feast. I had earlier thought of asking Amma to ask her neighbor for authentic bengali dishes. But I knew trying to understand a new cuisine over a long distance call will be very tedious. Amma was invited many times for a bengali fare at her neighbor's place. And Amma was saying, Mrs. M, was telling me some pesto besto, I didn't understand and I didn't want to sound impolite, so didn't ask her. With my new whatever little learnt knowledge of Bengali cuisine, I possess, I explained to her what it meant. So here I am with my first set of dishes that I tried and I must say we just loved it. Though I have previously prepared dough with only All purpose flour, this was the first time I am making it as a poori or deep fried. We make maida dough for Poli. The white poori tasted divine, I read somewhere that they offer luchi as neivethyam for Durga mata. No wonder, I thought. Throughout my cooking session, I had each member dropping in asking me how its coming up. It was very interesting on the whole. In all my previous RCI cooking, none of them really understood it. Now I guess they have an idea of what events are and how wonderfully they get treated with delicious goodies. I also wanted to make some sweet, but since I couldn't decide on one, I thought I will just go ahead with Misti Dohi. I guess setting the curds along with the sugar makes the difference. Because it was different. Though we are used to eating curds with sugar, it always has that tartness in the curds, whereas Misti Dohi was just sweet. Overall experience was yummy, one satisfied and great dinner it was. Best compliment was, hubby asking me to jot down these dishes in our frequent to do dishes. In a bowl, take the flour and salt. Mix well and add the oil. You can rub the flour with the oil for some 3 - 4 times, you will the oil well mixed with the flour. Gradually add the water and gather the flour together. Once you get the consistency where it doesn't stick to your hands, you are done. Now if you want to work out your palm, you can do that right now. This process is something that I like a lot, its very interesting to see the soft dough coming so well after you knead it well. The more you knead, the softer it comes out. Take a wet muslin cloth and cover it and keep it aside for sometime. I kept it for 30 mins. Once you are ready to roll out, divide the dough into equal round balls. Luchi calls for rolling out with oil and not flour. If you are used to rolling out atta dough with oil, this should not be a problem. Roll out the balls to make flat circles 4-5 inches in diameter. You can even use a lid to cut out perfect circles. But you got to ensure, its not thin and thick at places. I guess perfection in this area comes with experience. Heat a kadai with Oil and simmer it. By the time you want to deep fry, the oil has to be hot. So you can simmer it too. Roll out as many as you want and then proceed to fry each one. As with pooris, this is also best done with company. I normally roll out and Athamma fries. But this time, she was with the kids. So I rolled out a batch and fried each one after the other. Once the oil is hot, gently slide the luchi into the oil, make sure you don't just drop it, as oil might splash out. With the back of the slotted spatula, press on the luchi. This way it will puff up. once it puffs up, flip to the other side. Once its cooked on both sides, remove to a kitchen towel. Alur Dom ~ Potatoes in an exciting gravy! Sugar - I added about 1/4 tsp. She had said all non-bongs can go less on the sugar and increase the Red Chilli powder, that's exactly what I did! Pressure cook potatoes to 1-2 whistles, once done, let it cool and peel the outer skin. If you are using the baby ones, boil and then remove the outer skin. Then add the Onion and Ginger paste and fry with a tsp of sugar till the onion turns a pinkish brown. Everything will stick as a solid mass. Add the finely chopped tomato and sauté till its well cooked. I normally add salt at this stage to get the tomatoes to cook well. Simmer and add the Cumin Powder, Garam masala Powder, Red Chilli Powder with 2 tsp of yogurt. Since you are adding the curds, it might curdle, so simmer and cook on low flame. I added about 1/2 cup water as my folks won't eat dry gravy with poori. But this will be medium sautéed thick gravy as per the recipe. Finally garnish with chopped coriander leaves. I saved some for the plate decoration too! I remember Misti Dohi from my trips to Calcutta. Oh how I loved hearing them say the word. It has a rhythm to it. Since I knew I may not have time for any Bengali sweet, I thought Misti Dohi was the best option. Of course, I ended up eating all myself. Athamma won't eat sweets and hubby dear refused to touch anything sweet after that fabulous Luchi with Alur dom. Heat milk and mix with sugar. Let it come to lukewarm temperature, add the curds for it to set. It will be done in 6 hrs time. In our climate, we need the milk to be just warm and I add about a quarter of curds for it to set. Misti dohi tasted great. Though I have eaten this in Calcutta, I don't remember the taste and it was such a pleasant taste after the wonderful loch and aloof dump. Now I can't wait to prepare the other interesting recipes I have bookmarked. 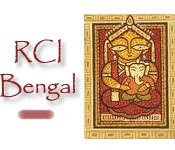 Sending my plate to our dear friend Sandeepa for her RCI Bengali. I hope she rises out of her hibernation to come and check this out. Thank you Sandeepa for your lovely recipes and for hosting this beautiful cuisine. We loved every bite of it!